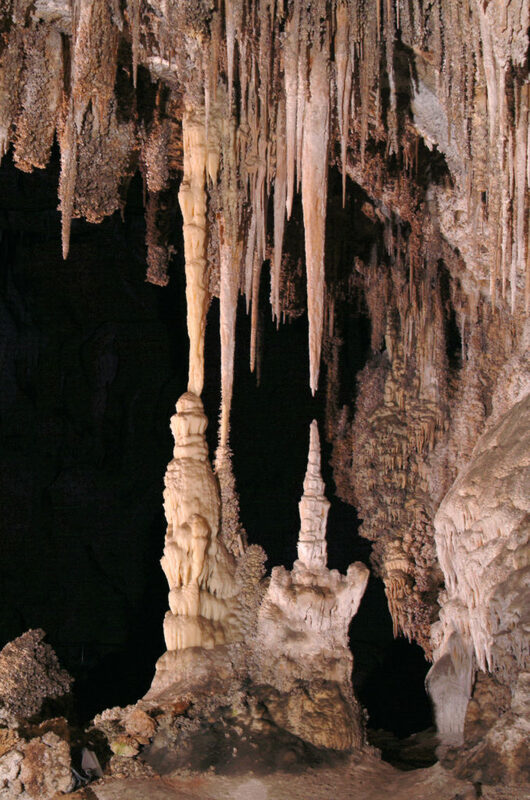 Located in the Chihuahua Desert of southeastern New Mexico, Carlsbad Caverns is actually 120 different limestone caves. And new caves are discovered all the time. Then each spring nearly 400,000 Brazilian free tail bats roost and brood in the cavern. 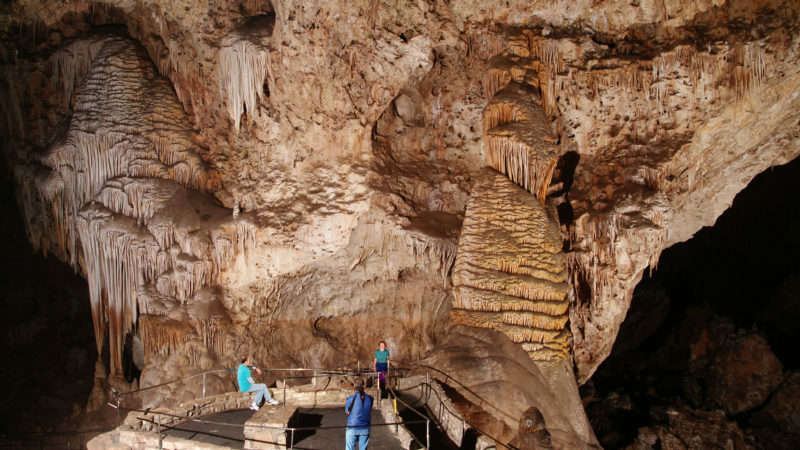 With a constant year-round temperature in the 50s and no rain in the cave forecast, any day is a great day to discover Carlsbad Caverns National Park in New Mexico with kids. If it’s your first time to Carlsbad Caverns head to the visitor center. Grab a Junior Ranger booklet. Check out the Ranger Programs. 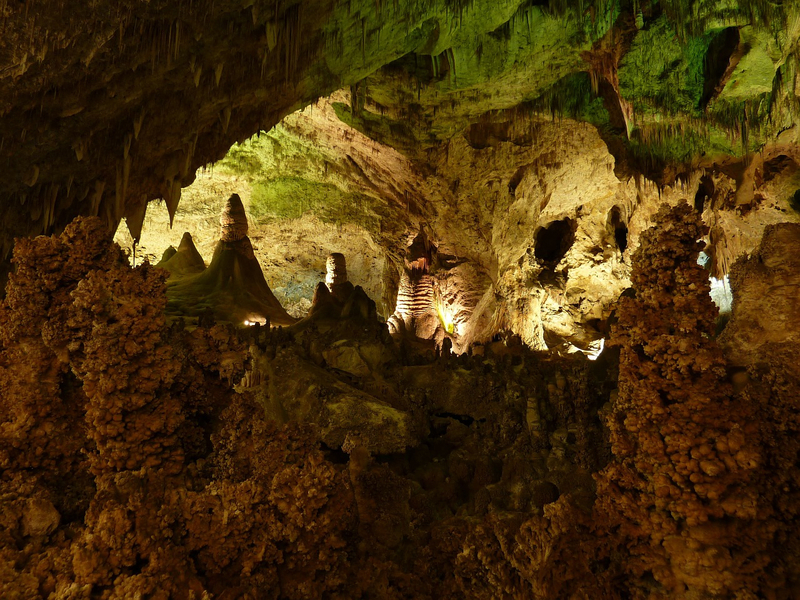 Carlsbad Caverns can be explored on your own. And you can use the elevators for one way into or out of the cave. Big Room Trail—See the largest single cave chamber by volume in North America with this 1.25-mile trail that mostly flat, and some of it’s wheelchair accessible. Natural Entrance Trail—Descend 750 feet through a series of steep switchbacks on this 1.25-mile trail. The Natural Entrance Trail meets the Big Room Trail, close to the elevators. As a popular national park destination, Carlsbad Caverns offers several types of ranger tours. Check in with the visitor center for availability. 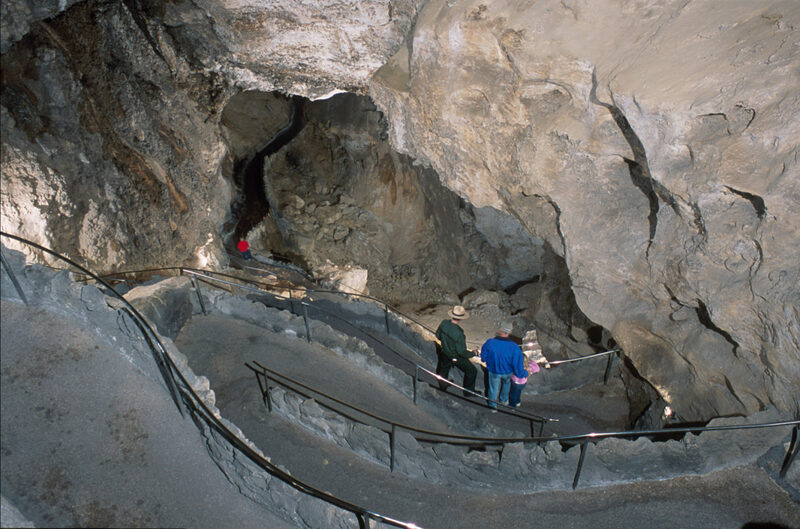 For visitors who prefer a guided tour of Carlsbad Caverns, it offers several, though two are offered daily. King’s Palace Tour—A one-and-a-half hour tour through four highly decorated rooms that covers one mile. Kids need to be at least 4 years old. Left Hand Tunnel Tour—Take a two hour candle light lantern tour on unpaved trails in an undeveloped portion of the caverns. Kids need to be at least 6 years old and everyone must wear closed-toed shoes. Ranger tours require an additional ticket. Reservations are recommended by calling 877-444-6777 or visiting Recreation.gov. Caves offer consistent conditions, like temperature, in their underground chambers. So any day is a good day. Though seeing the bats swirl out of the cavern at nightfall is spectacular. Attend the free nightly programming to see the Brazilian free tail bats emerge for their nightly feeding from Memorial Day weekend until October. Located at the outdoor amphitheater, the bat flight program depends on the time of sunset. TravelingMom Tip: Since bats are sensitive to light, electronic devices (including phones and cameras) are not allowed at the bat flight programs. Attend a dark sky program to explore the wilderness of Carlsbad after dark. Programming depends on weather and available on select nights. Check out the availability before arriving and check in with the visitor center for reservations. Kids must be 6 years old. Star Walks—Hike a .5-mile hike with the help of a red headlamp. Moon Hikes—Takes a 1.5-mile hike with the moon light leading the way. Star Parties—Explore the night sky with a ranger and a powerful telescope. Kids in caves? Yes! Most kids love to explore an underground world. Proceed with caution with a fearful toddler or preschooler. Listen to your child’s concerns. Touring a cave might be too much. Fear of the dark, enclosed spaces and creepy animals, like bats, are part of the cave experience. When in doubt, give your child a few years to outgrown their fears then add exploring a cave to your family trips. TravelingMom Tip: No strollers allowed in the caverns. Though a baby backpack is allowed for babies and toddlers. School age kids love caves since there is a different underground world to explore. Add a colony of bats and the kids will tell their friends at school. Be amazed how much your kids actually knew about caves. Teens like challenges and cave exploring offers lots of challenges. So use the Natural Entrance Trail instead of the elevators. Or sign up for the Left Hand Tunnel Tour instead of the standard King’s Palace Tour. It uses lanterns and goes off the paved route. 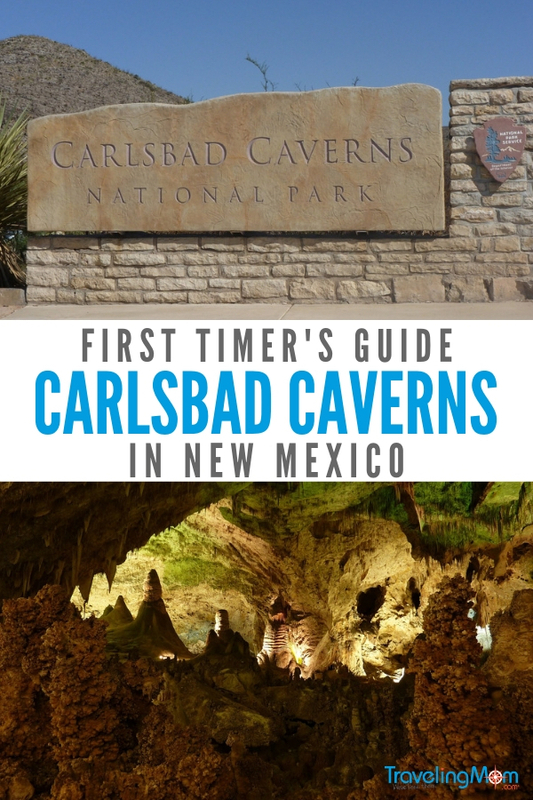 On a multi-gen road trip to California and considering a tour of Carlsbad Caverns? Part of the Big Room Trail is wheelchair accessible. And find elevators into the caverns. Get an accessible map that shows the shortcuts on the Big Room Trail or ask a Park Ranger. With mild year-round temperatures, a cave tour offers a break from summertime temperatures in the southwestern United States. About 265 million years ago an inland sea formed a fossil reef from the Permian age. Then sulfuric acid dissolved the limestone to create the karsts. Imagine a teen suspending a homemade wire ladder into utter darkness. That’s what Jim White did in 1898. Then he explored and named many of the notable features and rooms of Carlsbad Caverns. 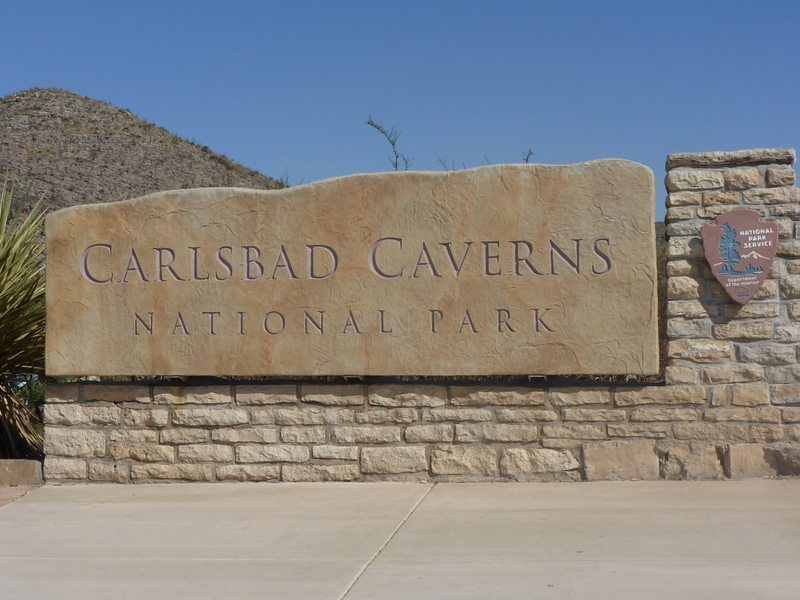 Carlsbad Caverns received its national park designation in 1930. However, it was first recognized as a national monument in 1923. In 1932, the National Park Service opened its modern visitor center with two elevators. It’s divided into two historic districts, the Cavern Historic District and the Rattlesnake Springs Historic District. 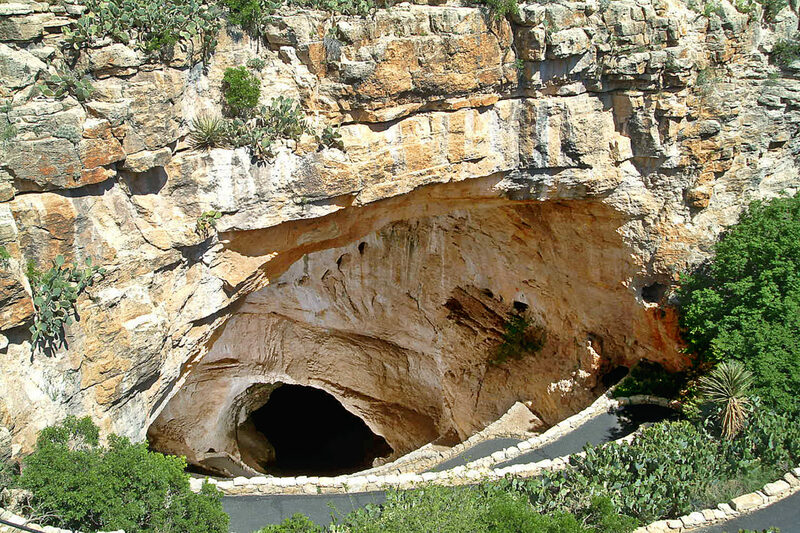 In 1995 Carlsbad Caverns became a UNESCO World Heritage Site. Located 20 miles southwest from Carlsbad, New Mexico, the visitor center’s address is 727 Carlsbad Caverns Highway. It’s 7 miles from the entrance sign to the visitor center. Find ample parking including parking for RVs. Adult admission (16+) to the Carlsbad Caverns is $15 and free for kids 15 and under or use an America the Beautiful annual pass. The visitor center is open from 8 a.m. to 7 p.m. from Memorial Day weekend through Labor Day weekend. And it’s open from 8 a.m. to 5 p.m. for the rest of the year. Open every day except Thanksgiving (in November), Christmas and New Years Day. Tours require an additional ticket. The town of Carlsbad, New Mexico, offers dining, lodging and activities. Red Chimney BBQ serves up Kentucky-style BBQ in a log cabin with third generation owners. Located at 817 N. Canal Street, it’s open from 11 a.m. to 8:30 p.m. Tuesday to Saturday. Trinity Hotel serves up lots of options in a building from 1886. Find espresso drinks and coffee everyday. Breakfast and Lunch served Wednesday to Saturday from 7 a.m. to 1:30 p.m. Dinner served Wednesday to Saturday from 5 p.m. to 9 p.m. Sunday brunch served from 8 a.m. to 1:30 p.m. Located at 201 S. Canal Street. Lucky Bull Grill serves up assorted burgers along with grilled items, like steak and fish. Open Monday to Saturday from 11 a.m. to 9 p.m. Located at 220 W. Fox Street. Carlsbad offers lots of lodging options for families with three-star accommodations. Fairfield Inn and Suites offers standard queen rooms along with suites with pull-out sofas. Find an outdoor pool and complimentary breakfast. Located at 2525 South Canal Street. The Stevens Inn offers standard queen rooms. Find an outdoor pool and complimentary breakfast. Located at 1829 S. Canal Street. Days Inn by Wyndham offers standard queen rooms. Find an indoor pool and complimentary breakfast. Located at 3910 National Parks Highway. Camping—Brantley Lake State Park offers over 100 sites with restrooms and showers. Find a playground for the kids. Located at 33 E. Brantley Lake Dr. and camping starts at $10. Living Desert Zoo and Gardens—Learn more about the Chihuahua desert by observing 40 desert animals and hundreds of native plants. Located at 1504 Miehls Dr. N. in Carlsbad. Open from 8 a.m. to 5 p.m. from Memorial Day to Labor Day and 9 a.m. to 5 p.m. the rest of the year. Adult admission is $5 and kids 7 to 12 $3 with kids under 6 free. Lake Carlsbad Beach Park—With seven miles of sidewalks along with rental kayaks, SUP boards and pedal boats, the Pecos River in the center of Carlsbad is a great choice. 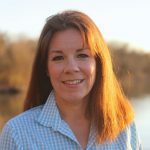 Carlsbad Cruises–Offering an one-hour guided boat cruise on the Pecos River. Adult tickets are $10 and $5 tickets for kids 2 to 12. Add another national park to your trip. Guadalupe Mountains National Park, just south of the New Mexican border, is 56 miles southwest of Carlsbad, New Mexico, along U.S. Highway 62. El Paso is 115 miles west. Mountaineers know Guadalupe Mountains National Park since El Capitan is the high point of Texas at 8,751 ft. It offers a developed trail for high pointers to reach the summit. Find over 80 miles of hiking trails with a rugged mountain backdrop in the Chihuahuan desert. For families, start at the Pine Springs visitor center, open from 8 a.m. to 4:30 p.m. Then take the .75-mile Pinery Nature Trail, part of the original Butterfield Overland Mail Route. Don’t forget to earn your Guadalupe Mountains National Park Junior Ranger Badge. Admission is $7 per person for a 7-day pass or use a NPS America the Beautiful pass. You can not wear any clothing that has been in another cave due to White-Nose Syndrome. THIS INCLUDES SHOES. And camera and camera equipment will have to be disinfected if it has been in another cave. White-Nose Syndrome kills hibernating bat colonies across the U.S. and Canada. It’s a fungus that thrives in low temperatures and high humidity killing 6 million bats since its discovery in 2006. Dress in layers since the cave temperature is 56F year round. Water bottles only are allowed in the caverns. No pets in the caverns, in the visitor center or on the trails. Find a kennel at the visitor center.